The NHS in England has reached a dubious milestone, with more than four million people waiting for treatment, including hundreds of thousands waiting beyond 18 weeks. Alison Moore examines the pressures driving the trend. One of the greatest achievements of the NHS in the first decade of this century was reducing waiting times so that most elective patients were treated within 18 weeks – a world away from the bad old days of two-year waits. But that promise of swift treatment, which is enshrined in the NHS Constitution, now seems to be under threat. An increasing number of people are waiting more than 18 weeks and an escalating number are waiting more than a year, despite government pledges. Many more patients are waiting for treatment: more than four million in England in June, once trusts not reporting their performance are added in. Director of policy at think tank The King’s Fund, Richard Murray, described reaching the four million figure as a ‘symbolic moment for the NHS’. ‘Taken together with the fact that the NHS has missed the waiting times standard – 92% of patients within 18 weeks – for over a year, these statistics show it is unrealistic to expect the NHS to continue to be able to offer the same standards of care within the current budget,’ he said. This has been recognised with a tacit acceptance from NHS England that prioritising politically sensitive emergency department care could lead to poorer performance against the 18-week waiting time standard. Mr Murray says the news on A&E – where the target of 95% of people seen in four hours has been missed since 2015 – is more positive, with a chance the NHS in England will get back to 90% achievement soon. But the pressures could soon be back. ‘The next test for A&E will come – as it always does – in the winter,’ he says. So what is going on with waiting times? The numbers waiting more than 18 weeks for treatment have increased over the past few years but the real concern is the growth in the total number of people on the waiting list – which has gone up from just over two-and-a-half million people seven years ago to four million now, with some people predicting it could rise to five million within a few years. Part of this is simply the growing population, which has gone up by three million in the UK since 2010. However, a more significant factor is likely to be an ageing population requiring more healthcare – whether elective or emergency – and often a package of support at home afterwards. This can mean they are stuck in hospital, occupying a bed they do not need to be in, which prevents others being admitted. This growth in numbers waiting means that just to keep waiting times where they are now the NHS has to carry out more procedures each month. Worryingly, the number of people admitted for surgery dropped in June. If that continues, waiting lists could become longer in future months. He points out growth in waiting list lengths being so far ahead of population growth may indicate a change in treatment thresholds for some conditions. She says that for some patients waiting longer for elective surgery can mean more time in pain, or deterioration in their condition while they wait. Waiting longer can also extend the period people are unable to work, delay recovery and the return to a normal life. Many patients experience anxiety and discomfort while they wait for elective procedures. The Patients Association helpline frequently takes calls from those facing long waits. Recent calls have included a patient waiting for a date for gall bladder surgery and having intermittent pain during the wait; a caller waiting more than a year for a back operation, and a caller waiting to see a neurologist with what he suspects is multiple sclerosis, and becoming depressed with an ‘intolerable’ wait. Ms Aiken points out there is little evidence about the effects of waiting longer on patients and has called for more research on their morbidity and mortality. Many people who are waiting will have contact with nurses during this time. This may be important as research by the Patients Association suggested around 10% of providers do not have processes to pick up patients’ changing needs as they wait. 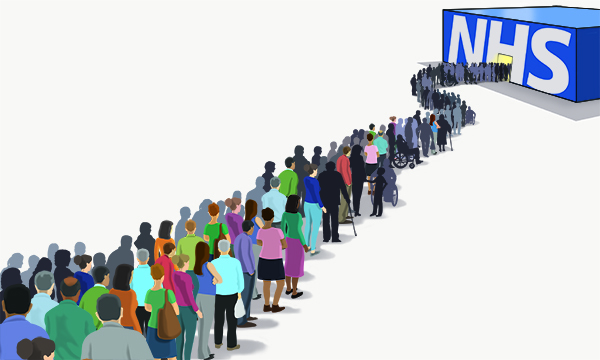 Four million – the likely number of patients waiting for treatment in England's NHS in June. Official figures are slightly lower, at 3.83 million, but a number of trusts are not reporting their waiting lists. In June 2010, this figure was considerably lower, at 2.57 million. 373,182 of these people have waited more than 18 weeks, which is the standard set out in the NHS Constitution. Performance against 18 weeks is lower than in 2010, at 90.3% rather than 91.4%. 1,544 people have waited more than 52 weeks. In June 2010, this was much higher, at 18,221. The figure then fell to a low of 214 in October 2013 but has risen steadily since. The decline in emergency department performance has been much more marked. In July it was 90.3% waiting more than four hours to be admitted, or treated and discharged within four hours. In August 2010, performance was 98.1%. Health unions says new figures detailing ambulance delays show ‘a whole system under strain’.